The Featured Artists Coalition got off to a roaring public start this week. 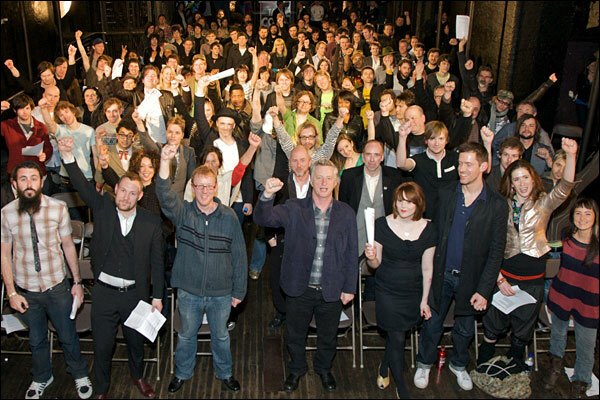 I had the honour of presenting the first general meeting of the organisation and introducing the key speakers Billy Bragg, Ed O’Brien, Kate Nash and Dave Rowntree. They each spoke from their individual experience and with great personal passion about how much freedom they felt in being able to create their own direct relationships with their fans and audiences, and make their own decisions about how to release their work. The meeting started with this video and it was clear that they each felt the incredible degree of change in the world has to be a source of excitement and opportunity for forward-thinking artists. The FAC is a reflection of that. No one knows yet exactly where the focus of this new organisation will be exactly or what direction it will take, but the vibe in the room at Heaven was energised and hugely optimistic. There was a real sense that this was a historic moment in the development of the music industry, that this was the day when artists finally were acknowledged as being at the centre of the industry – and not a peripheral asset to be bargained down and exploited – the day when the record companies joined the ranks of suppliers to the artists – alongside collecting societies, publishers, digital delivery platforms, social and mobile network operators – and even gasp – managers! Of course, the range of opinions among different artists about how to respond to technological and business challenges will be as diverse as are the artists themselves. But the underlying principles of a desire for transparency and for fair-dealing in the commercial aspects of making and selling music – and the desire to maintain personal ownership of their creative output – are incredibly strong unifying factors which bind together the interests of new and established acts. There were unsigned bands who expressed real concerns: “If we sign up for the FAC, will that put our relationship with a major label under threat?” asked one new act about to sign a recording deal with a major. From the organisers of the FAC that was certainly not the intention and by the sounds of the welcoming comments from the BPI, it was not the view of the labels either. But there was also a real hunger for guidance and advice on a wide range of topics from navigating the digital landscape to contract reviews to advice on selecting a manager. The arrival of the FAC will be a tremendous enlightening and progressive force in the industry and should quickly be able to get to a point when it can act as an authoritative guide and give bands a chance to take a step back and reconsider their options. The FAC has the opportunity t0 offer real advice on approved alternatives to artists so that they can make informed choices about whether they want to sign to a label, go via digital distributor platform or set up their own site to sell to their fans. Much has been said too about how the FAC will negotiate rights for its members and seek to take a seat at the table with the major players when deals are being struck. It will be interesting to see how the strengths of the organisation can be directed to best use in this area. Some companies like Myspace Music have been cautious in their response to first soundings, while others like Nokia welcome the direct involvement of artists and the creative community in what they’re doing. There is lots of work for the FAC steering committee to do right now, including hiring a staff to turn these aspirations into reality. So wish them well on this journey, music should be the better for it! My good friend Toni Schneider who has something to do with this little thing called WordPress – whatever that is! Linked me to this video. You must watch this and know this information now! If you ever doubted that we live in amazing times and that there are reasons to be optimistic about this world – this video will give you the facts to convince you.